I've been noticing significant development in the residential 24th Avenue neighborhood. First a new wine bar, 24, opened up and just this past weekend a small cafe/sandwich shop called Munch opened too. Although the name is not my favorite (I hold a similar sentiment towards it as I do for the name Winegasm), the place is friendly, charming and serves good food. They had a tasting of their various offerings this weekend and I was able to sample a couple of things--and liked them a lot. 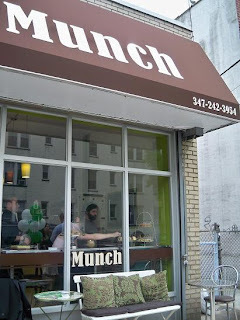 Munchwich - Their signature sandwich with corned beef and zesty coleslaw captured my attention. The bread was nicely toasted and its contents were warmed too, giving it that comfort-food feel. The slaw was crunchy and fresh and the quality of the deli meat was great. I'd like to get this again in a regular portion. Sandwiches range between $4.95 - $5.95, depending on size. Shrimp Ceviche - Not having high expectations for this, I was surprisingly impressed. The shrimp was delicious and the broth was refreshing with welcome additions of cilantro, onion and nuts. It'd make for a good snack or starter. I'll follow-up with a menu soon, as they didn't yet have it available this weekend. Although there isn't much room to sit inside, there's a comfortable-looking bench and a small table outside, providing a nice way to enjoy your sandwich, morning coffee, a snack or what have you. Sparrow and Munch show the same address. I know - that's the address they list.